Proper management of on-farm animal mortalities is vital to every farming operation. Improper disposal of dead animal carcasses can negatively impact surface water and groundwater from carcass leachate. If the animal died of an infectious disease, pathogenic bacteria and viruses may be present within the carcass. These pathogens can be spread by insects, rodents, predators, and subsurface or above ground water movement, as well as through direct contact with other livestock or poultry leading to increased disease transmission risks. In addition, Oklahoma has rules regulating the disposal of livestock and poultry mortalities. Concerns associated with improper disposal can be avoided by practicing state approved carcass disposal methods. Perhaps the most common method of disposal is burial. When proper guidelines are followed, burial is a safe option. However, poor site selection, such as sandy soils or areas with high water tables, may pose a threat to groundwater. 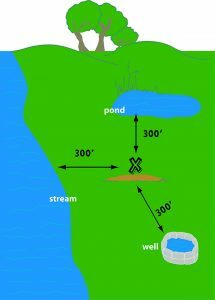 Figure 1 illustrates the proper placement of a burial site with respect to distance from water bodies. The current (2009) Oklahoma burial guidelines are listed below. For additional regulations on carcass burial, refer to Oklahoma Statutes Title 21 Sections 1222 and 1223 found by searching www.oscn.net. Figure 1. Site selection for burial. • Burial of dead livestock and poultry requires the construction of a pit. • The bottom of the burial pit must be at least 1 ft. above any floodplain level and at least 2 feet above the seasonal-high water table. 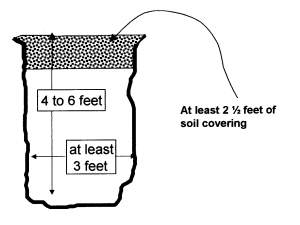 If there is bedrock in the area, the bottom of the pit must be at least 2 ft. above the bedrock. • The burial pit must be located at least 300 ft. away from any wells, waters of the state, neighboring residencies, public areas or property lines. 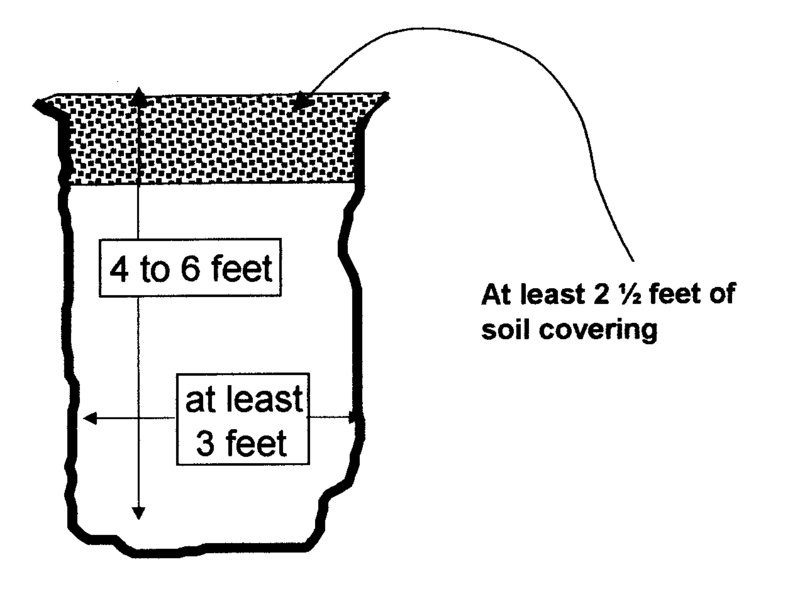 • Carcasses must be covered with a minimum of 2.5 ft. of topsoil after placement in the pit. Burial pits should be routinely inspected to ensure wild animals do not dig and drag carcasses away. Figure 2. Cross sectional view of burial pit for disposal of poultry mortalities. Incineration is a safe and effective means of carcass disposal, especially from the standpoint of biosecurity. The carcass is completely consumed by fire and heat within a self-contained incinerator. In Oklahoma, an air quality permit may be required by the Department of Environmental Quality (DEQ). This requirement is based on the size and quantity of carcasses burned. For questions concerning permit requirements, contact the DEQ at (405) 702-4100. Incineration is mainly designed for smaller carcasses and fuel costs should be considered. Due to odor and emission concerns, open air incineration is not allowed in Oklahoma unless the animal died of an infectious or contagious disease. Another state approved carcass disposal method is rendering. This is a heat driven process that cooks the product while killing pathogens and converting it into a value-added product such as an animal feedstuff. These feedstuffs, such as meat and bone meal, are generally used as pet food ingredients. Although rendering is a very effective method, currently, there are few rendering services available. The transportation expense of collecting small volumes creates a financial obstacle for most rendering companies. Some rendering facilities require the producer to transport carcasses to the plant and pay a fee. Biosecurity and disease transmission risks should be considered when allowing vehicles on the farm and when transporting carcasses off-farm. Visit www.poultrywaste.okstate.edu for a current list of available rendering services. Composting dead animal mortalities is an inexpensive, biosecure and environmentally sound approach to addressing the issue of carcass disposal. By definition, composting is a controlled biological decomposition process that converts organic matter into a stable, humus-like product. The carcass (nitrogen source) is buried in a bulking agent (carbon source), such as wood shavings, allowing for the proper carbon to nitrogen ratio (C:N) required by microorganisms to successfully decompose the carcass while absorbing excess moisture and filtering odor (Figure 3). The high temperatures (130 F to 150 F) achieved through proper composting will destroy most pathogens. Microorganisms will degrade the carcass leaving only a few small bone fragments, which are brittle and break easily. This valuable by-product can then be land-applied as a fertilizer source, adding nutrients and organic matter to the soil or recycled for new compost piles. As with burial, site selection is important. The site should be located in an area that does not pose a risk to surface or groundwater contamination. Catastrophic losses are best composted in windrows of bulking agent due to the increased quantity of carcasses. Height, width and length of these windrows are dependent on the size and amount of carcasses to be composted. For both routine and catastrophic composting, piles must be appropriately managed to achieve proper decomposition and prevent scavenger invasion. Figure 3. Illustration of composting livestock. Proper livestock and poultry mortality disposal is essential to the sustainability and environmental stewardship of farming operations. In addition, state laws regulate disposal methods. By practicing the state approved methods, disease transmission risks to humans and animals can be reduced. If you have questions about any of these carcass disposal methods, contact the ODAFF Agricultural Environmental Management Services at (405) 522-4659 or visit your local County Extension Office.